We could all learn a lot from a certain Italian plumber. And no, not about how completely ignoring your profession leads to happiness, or that you should always get on board airships with strangers. 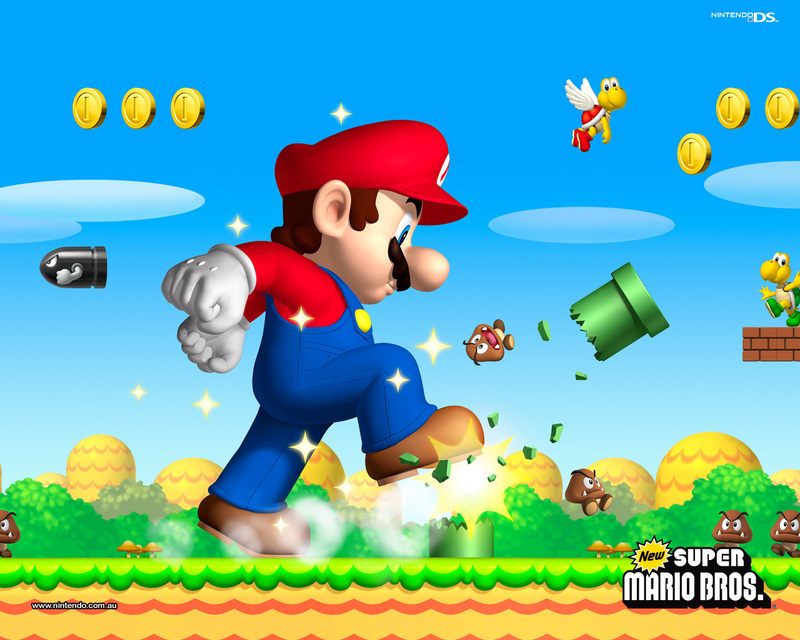 Rather, the success of Mario can tell us a lot about the qualities of good game design. Recently, I had the opportunity to boot up an Intellivision for the first time. As someone who played the NES before I could even dress myself, I was excited to get the chance to try out something from before that era. I toyed with the system deep into the night, cycling through a vast library of games and getting a taste of what it was like to be a gamer in the early 80s. After hours and hours, I came to a conclusion: almost all these games were horrendously designed. Despite predating Super Mario Bros by five years, the Intellivision failed. The difference between the two systems is that the team behind Mario had a surprisingly strong idea of what went into making a good game. Want to know why the yellow guy from Night Stalker didn’t end up being the go-to video game icon? Read on. Finally, a game with a 52 card deck! Let me tell you about a game. You are a little guy in overalls and a red hat – allegedly a plumber – running around and hitting blocks that items occasionally pop out of. Certain items change your size or give you abilities. The enemies are brown lurching blobs and turtles, with the occasional fanged plant or cloud-riding spike-throwing enemy tossed in for good measure. You travel through a range of worlds going up and down pipes, jumping on flags, and dropping the bad guy into lava. You’re certainly not selling anybody on the game by describing it, and there’s more or less a non-existent story running behind all of this to tie everything together. To use a popular word these days, the game is very difficult to grok. To this day, nothing that happens in the Mario franchise really makes any sense at all. Fortunately, it doesn’t need to. 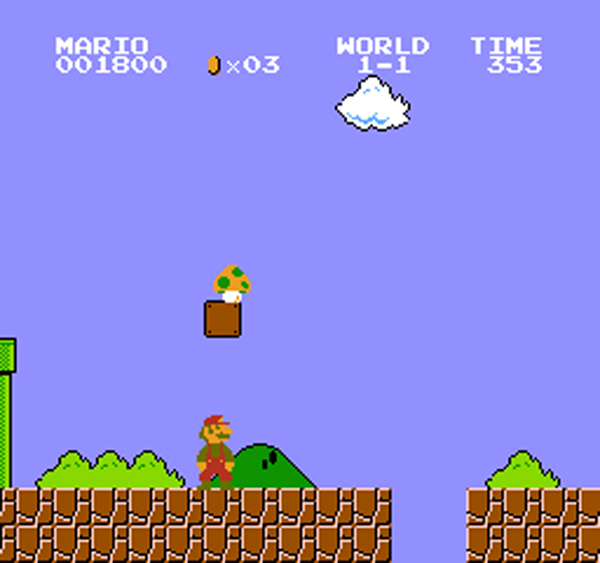 The basic gameplay of Mario games is intuitive to almost everybody. Even as far back as the original game on the NES, my parents could just pick up the controller and start playing without even needing the instruction booklet. Why? When your only abilities are running and jumping, then it makes sense pretty fast that you beat enemies by jumping on them. When blocks sparkle and have shining question marks, it’s very intuitive that those blocks are different and you should hit them. And that’s really all you need to know to play. Sure, maybe it takes one or two lives and a little trial and error to find some of that out, but it all feels natural. The rest of the details become apparent as you continue onward. Even in modern-era Mario games, the same kind of tropes are kept. The game has become more complex, but it never strays too far from simplicity. A lot of games, video, board, and card, all the way from the 80s to today, try to be too ambitious and end up falling flat because of unintuitive complexity. Many of the Intellivison games I played not only made no sense, but were far more complex than what should have been happening on the system. The fact that Mario has been successful despite the game making absolutely no sense is a miracle of the design behind it. Every Mario game builds on the last and reels you in while still being fresh and exciting. How? There are two parts to this. First, the franchise has nostalgia that anybody who has ever seen another Mario game played can recognize. The same kinds of enemies always show up. The same digitally remastered beeps and boops from the original still echo as you grab coins and mushrooms. There will be Easter Eggs and in-game references to past adventures. Of course, people also don’t just want to play the same game over and over. As a result, new twists are put on the adventure. Somebody asks, “What if Mario was in space?” and a game is born. You’ll notice that the core game never changes that much, just the worlds that are visited. Each game is a mixture of the familiar and the new, some more so than others, which keeps the series fresh yet familiar. A good analogue might be something like Magic. The game constantly visits new worlds and has new mechanics. However, a lot of the same base abilities and gameplay shows up in every set in addition to new themes. Furthermore, there is always a pull for nostalgia. When you play something like Scars of Mirrodin, the fact that Scrapdiver Serpent reminds you of Neurok Spy, or that there are a new set of Spellbombs, tug at the memories of old players while being fresh to new players. Mario is similarly successful. As I talked about in another blog post, having game mechanisms that feel good is important. Mario is chock full of those. You get where this is going. Dying can be frustrating, but the Mario series seeks to mitigate that. It doesn’t do it completely, but it does a pretty good job of it. First of all, dying doesn’t set you back too much. There are usually checkpoints within levels in the sidescrolling platformer games, and in the newer era of Super Mario 64 and Super Mario Galaxy, each star-collecting task is small enough on its own that being bumped out of the level only costs you a handful of minutes. On top of all this, there are the aforementioned Easter Eggs for experienced players. A great “feel good” moment is when you realize a connection between games and it feels like the game is directly speaking toward you. With the Intellivision, I had a constant fear of dying. The game was full of tension, and I was seldom rewarded for what I was doing. Often, your “reward” for completing a task was simply not dying. You need a little more to keep you coming back. The way Mario plays out feels good without the constant terror of dying. No matter which world you go to or where you end up, there are constantly rewards to collect that make you feel good for playing. While on Thanksgiving break I managed to spend a few hours with my long-lost friend Super Mario Bros. 3 on the Super NES. And you know what? It was just as much fun as it was when I was six. Part of that stems from the inherently fun nature of the game. However, I think a lot of that comes from replay value. Mario games are built with replayability in mind. First of all, there are so many levels that the average player isn’t going to memorize the intricacies and challenges of each one. But, more importantly, you don’t always have to go through the same levels. How many of you felt that warm, sneaky feeling inside when you realized you could get through Super Mario 64 without needing to play a third of the levels if you just found all of the stars on the earlier courses? I know I was one of them. However, if you take the speedy route through the game, that means you left worlds and areas unexplored. When you boot the same game up a year later, you can go back and play the same game through again while discovering all of these levels for the first time. 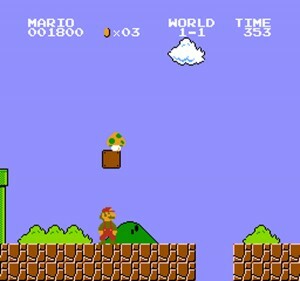 Even as far back as the original Super Mario Bros. you can see this kind of gameplay. How many people out there always take the warp pipe in the first underground level and skip three worlds? I know I’m one of them. However, if you mess up and don’t end up taking that warp pipe there are still untouched worlds out there for you to explore. Moreover, in recent games Nintendo has found ways to build in replayability. 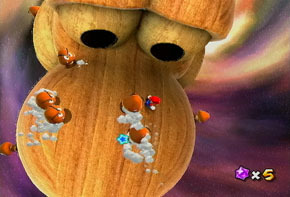 The purple coin stages in Super Mario Galaxy are a great example. They’re just an additional incentive to play the game again. It goes to show you don’t need achievement systems to reward players for playing your game over and over; you can put reasons to replay your game within the game itself. Years later, I can still find new pieces of the same old Mario games I have always loved. That’s incredible. The Intellivision? Not so much. I’d play a game once or twice, and then never want to come back to it again. Back when I played a lot of video games, I used to read a lot of video game magazines. Because overused tropes draw in subscribers, I remember one magazine doing a “top 100 most important moments in gaming” countdown. What was #1? The hidden 1UP mushroom in the first stage of Super Mario Bros.
Now, I don’t know if I necessarily agree with that. However, it’s certainly up there. Why? The moment you realize there’s more to the game than just what you can see, your mind begins to wonder about everything. Secrets add to the replay value, sure, but more than that they keep you engaged. You’re always on the lookout for something not everybody else can see. When you find one, it feels incredible. Remember when you showed your friends that you could run on top of the level and reach a warp pipe in the first underground stage of Super Mario Bros.? Or when you found the secret exit out of a ghost house in Super Mario World? Or when you found out you could go through the window to Peaches Super Slide in Super Mario 64? These moments all add up to a mixture of replayability, memories, and fun. The series would not be the same without these little tricks that reward the experienced player. That wraps up why Mario will always be number one. Do you disagree or think I missed a reason? Let me know below! On another note, between the holiday season, a busy Magic season, and finishing up school, I hadn’t made a post in a month. Now that school is over and the rest of those are wrapping up, look forward to more blog posts in the near future. This blog of yours always manage to get me with all these analogies. Picking up Magic after 3 years was like picking a Mario game, it was the same old great game with a few stuff added that took me nearly nothing to understand. And yes, I remember how proud I was in SMB3 with the flutes and how you could skip all the game with them, heh. The thing one has to remember about early video games is that they were based on a model in which you had to kill the player frequently in order to persuade them to insert more coins. I find it very interesting that you write about Mario here as though it was a game. Mario is at most a game series and arguably just a brand. I also find your comparison with Magic unconvincing. Magic must copy its own previous incarnations – it has no choice. This requirement for backwards compatibility combined with its first-mover advantage suggest Magic is perhaps more like Microsoft Windows than Mario. Indeed, Super Mario 64 was the opposite of Magic – it was fearlessly innovative. At the time, 3D platforming was an untested concept. To take the world’s most valuable 2D platform series and make the next major iteration in 3D and then make that a launch title for a new console is breathtakingly bold. Of course in retrospect we know they hit it out of the park, but I can see how that kind of decision could have killed the series and maybe Nintendo with it! This is the first time I have read your blog and I must say that I am very impressed. I am 22 years old and I can’t remember a day that Mario didn’t exist. I am a die hard Mario fan and have owned and beaten just about all of them outside of some obscure games like yoshi’s story or newer games like super princess peach. This post highlighted a lot of the reasons that I love Mario to this day and why every time I hear that there is a new game coming out I feel my inner child get super excited. Thanks for this great post. Wow. I never expected you to be such a good writer on stuff like this, and I think you hit the nail on the head with this blogpost.